Strength training is not weightlifting. Strength training is not lifting weights. Weight lifting is a competitive sport. The objective for each athlete is to complete one repetition in a specific type of exercise with as much weight as he or she possibly can lift. Success is determined by lifting more weight for one repetition than your opponents. Lifting weights is a solo biomechanical activity in which an individual moves weighted objects, usually for several repetitions, against the forces of gravity. Success is determined by progressively becoming able to complete more repetitions with more weight. What is paramount in both weightlifting and lifting weights is that an individual gradually becomes capable of lifting higher amounts of weight. These are external actions, the success of which can be seen and judged by observers who are present at the time in which these events occur. A by-product from each of these disciplines is that the lifter becomes stronger. Strength training, by contrast, is an internal discipline, a series of psychomotor events within the mind and body of an individual, most of which cannot be seen or judged by an observer. Your primary goal is not to lift more weight or to do more repetitions. Instead, as a strength trainee, your foremost objective is to contract your target muscles as forcefully as possible and then stretch them as far as your brain tells you is safe. The dumbbell you are holding, the amount of weight you are lifting, and/or the machine you are using are miles away. You are focused solely upon feeling your target muscle fibers in that specific exercise shorten powerfully and then lengthen completely. How much weight you lift and/or the number of repetitions you complete are significant, but only secondary factors, that is, by-products of strength training. When you practice strength training as described above, with great mental focus upon intensifying your internal mind-muscle experience, you will gradually become capable of lifting fairly heavy weights. However, in all probability, these weights will less than what you could have lifted, if you had concentrated primarily on lifting heavier weights. Why? Because in strength training you develop the capability—and the habit—of contracting your muscles more forcefully than is actually necessary to lift a weight. Consider the example demonstrated in the next paragraph. Stand erect with your right arm hanging down to your side, the palm of your hand facing forward. Place the fingertips of your left hand directly upon the front of your right upper arm, your biceps. While keeping your right elbow at your side, raise your right hand until it reaches the level of your shoulders. You should feel slightly more tension in your right biceps muscle as it shortens than when it was hanging at your side. Now lower your right hand slowly to your side again, maintaining left fingertip contact with your right biceps. You should feel the biceps muscle relax and lengthen. Next, in the same beginning position, imagine you are standing on top of a mountain cliff you have just climbed. On a narrow ledge, just eighteen inches below your feet stands your best friend, too exhausted to climb any higher. Looped under his buttocks, he has a rope that passes around his hips, through both of his hands, and into the palm of your clenched right hand. Your right biceps feel stretched by the weight of your 200-pound companion. Concentrating intently, imagine you are lifting your partner up the last eighteen inches of the cliff, using only the power of your contracting right biceps muscle. Did you feel a difference in the muscular tension of your right biceps when you were lifting your friend, as opposed to when you were raising your empty right hand to shoulder level? Having performed this experiment with hundreds of people over many years, I have yet to encounter anyone who did not feel a more powerful contraction, more muscular tension, in the right biceps while lifting her friend than when just raising her hand to shoulder level. Why? Did we change the amount of resistance? No, in both cases we were lifting only the weight of the right forearm and hand. Did we change the number of repetitions? No, in both cases it was one. The only thing we changed was the degree of our neuromuscular concentration. By imagining we needed to contract our right biceps very strongly to lift something very heavy, we created a force much more powerful than would be needed to lift the weight of our forearm and hand. The foregoing example illustrates precisely what you can do in performing strength training exercises. 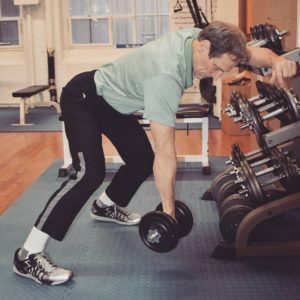 Instead of centering your attention on the equipment you are using or upon lifting a certain quantity of weight a certain number of times, focus intently upon the quality of the contractions you are achieving in the particular muscles you are exercising. Try to contract and extend your muscles as forcefully as you can within the limits of what your nervous system tells you is safe. In the mountaintop experiment, you generated a moderately powerful contraction of your right biceps muscle using no resistance other than the weight of your forearm. If you can produce powerful muscular contractions without any lifting any weight, imagine what you can accomplish with a few strength training instruments! This is the secret of successful strength training: While lifting moderate to moderately heavy weights, teach yourself to contract your muscles as powerfully as you would if you were lifting very heavy weights. Training with intense mental focus upon your target muscles, rather than upon the resultant actions in the equipment you are using, is the most important and distinguishing feature of adult strength exercise. What you use for resistance, whether a weight stack on a machine, dumbbells or barbells, elastic bands or flexible rods, and/or what you push and pull against, are only tools. What matters most is that you concentrate upon feeling your muscles contract firmly and fully and then lengthen slowly and completely while maintaining your best possible form throughout each repetition of an exercise. The objective is to challenge your muscles until you cannot comfortably continue and then stop. You do not have to push yourself to the point of extreme pain. Instead, just nudge yourself to contract and stretch your muscles a little more completely than you have in the past. By striving to exercise in this introspective manner, you will discover entirely new dimensions in strength training and in your body. You will measure your progress not by how much more you can lift in the gym, but by how much stronger, more flexible, and more coordinated you feel as you pursue your other favorite physical activities, the ones outside the gym. You will find yourself looking for hills to climb; and you will enjoy an enhanced awareness of your muscles as you climb. When you train with internal mental focus, your muscle mass and the amount of weight you can lift will increase naturally to the extent you need to be healthy. Your workouts will never be boring because you know you go to the gym for an exciting physical experience, not just to lift weights. You never will be frustrated because the focal points of your training are you and reaching your own personal potential for strength and good health. You will transcend the world of barbells and dumbbells and enter the fascinating realm of your inner self. At this level of personal awareness, you feel a unique internal glow that comes from challenging yourself vigorously. You realize, without any doubt, this is a feeling you want to experience for as long in your life as possible.